Firozabad (Uttar Pradesh), Feb 19 Uttar Pradesh Chief Minister and Bahujan Samaj Party supremo Mayawati Saturday said here that "gunda and mafia raj" would return to the state if the Mulayam Singh Yadav-led Samajwadi Party came to power in the assembly polls. 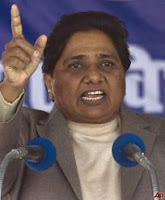 Addressing a rally at the CL College ground, Mayawati said the central government was corrupt. She said she had already removed corrupt ministers from her party and other tainted people would be weeded out soon. To tune kya gand marai hai kya pure 5 sal??? ?